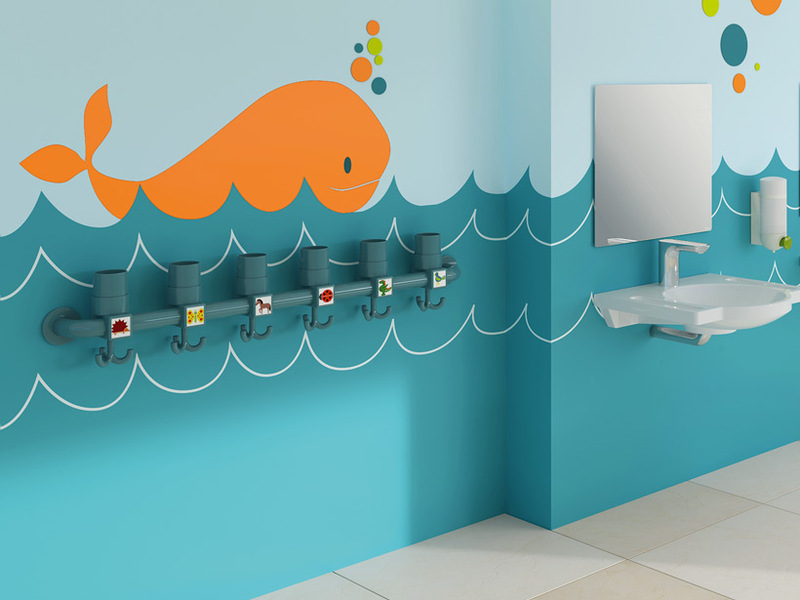 HEWI products for children are tailored to the needs of small users - whether in daycare centres, kindergartens or schools. Rooms for children must be practical, easy to clean and safe. 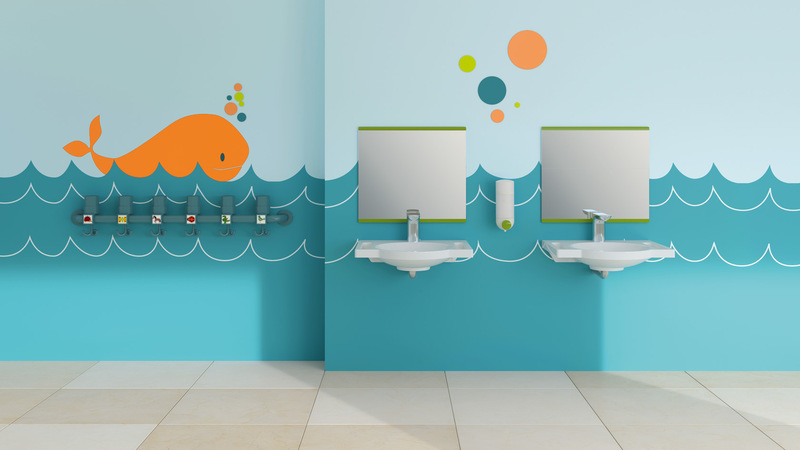 HEWI has developed products that optimally meet these requirements and also offer a wide range of design options - child-friendly and individual. The new Kids Mobiliar opens up space for design diversity. Due to the module principle, it is particularly flexible and fits into almost any kindergarten or primary school corridor. The single cube forms the central design element and can be individually extended. The different modules (single, row or double modules) can be arranged and combined as desired. Asymmetrical solutions are also possible. Triple hooks create additional order and set coloured accents. Ergonomic benches in various heights complement the furniture and blend harmoniously into the design. The new furniture system is thus suitable for small and large users. Products for kindergartens and schools must be able to withstand high loads in the long term. 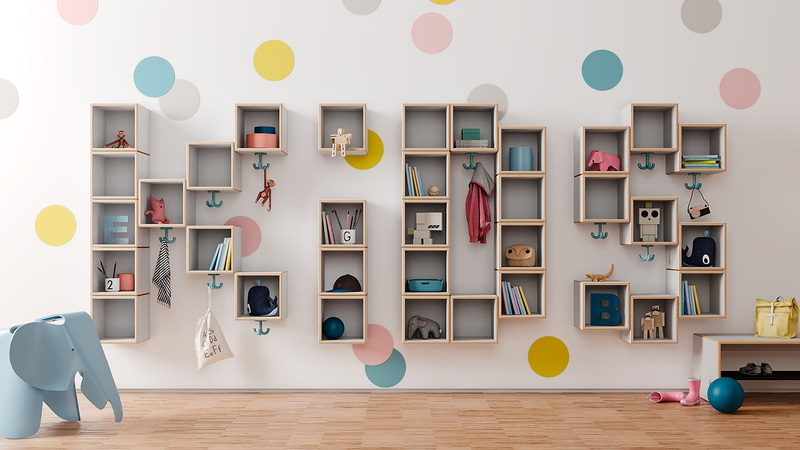 The high-quality modules are made of birch plywood. The material is particularly robust and easy to clean. The products are designed in such a way that the risk of injury is excluded as far as possible. They have been tested for increased requirements in kindergartens or schools according to the applicable GS guidelines (tested safety). The development of HEWI products for children focused on safety. 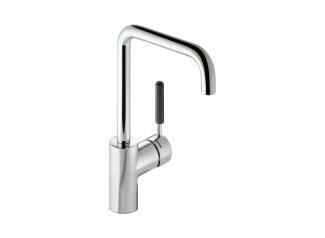 The fine radii of the washbasins do not allow any corners or edges to develop at all that children could bump into. 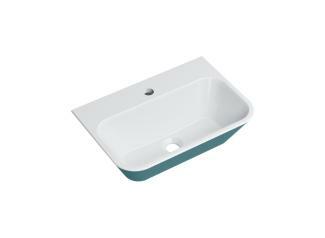 The narrow rim as well as the compact design of the mineral cast washbasins enable even small children to reach the tap effortlessly. 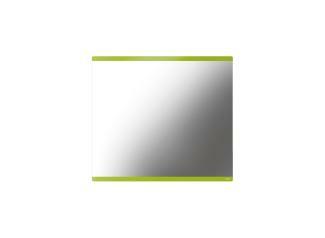 The mirrors made of ESG safety glass have a splinter protection film and a safety catch. 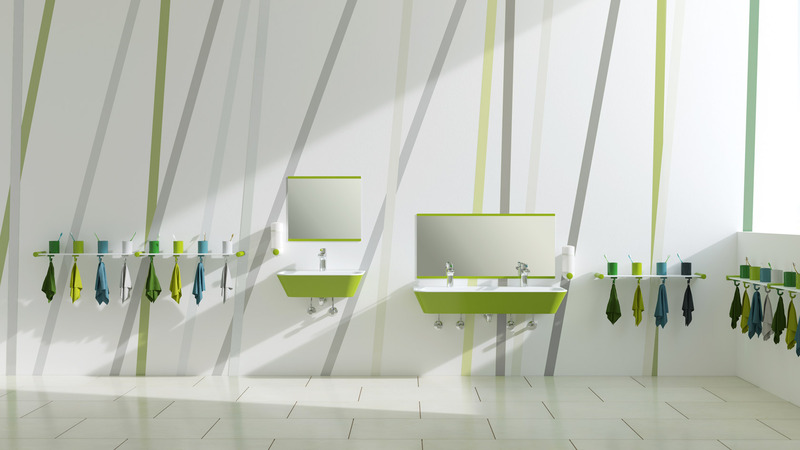 The washbasins and mirrors are optionally available in classic white or in a two-tone version with an accent in cheerful apple green. 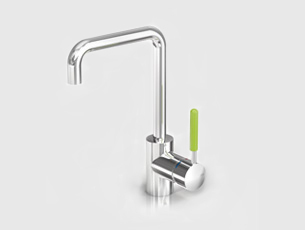 HEWI fittings for children are characterised by their particularly easy operation. Various operating modes train the child's motor skills. The practical toothbrush cup strips offer plenty of space. They can be extended by any number of four places by means of a supplementary module. The toothbrush cup strip with towel hook is available as an option. The coloured gripping area of the fitting signals use and supports children in intuitive use. 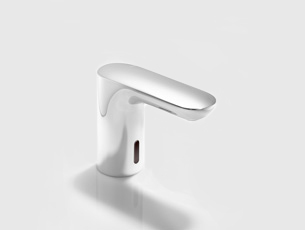 The polyamide handle not only adds a colourful accent to the bathroom, but also highlights the control element in a slightly visible way. 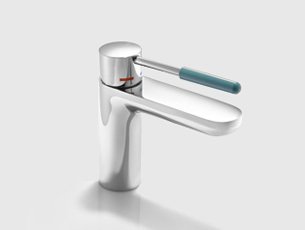 The electronic HEWI SENSORIC washbasin fitting is child's play to operate without any effort. 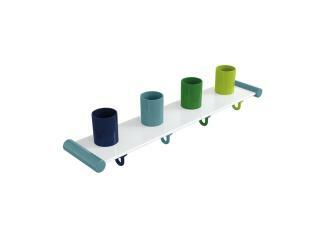 The colourful wardrobe rails from HEWI can be combined with various hook shapes. The number of hooks can be determined individually and thus also the length of the wardrobe. The wardrobes are made of high-quality polyamide. A steel core inside increases stability and makes it a permanent part of the building. 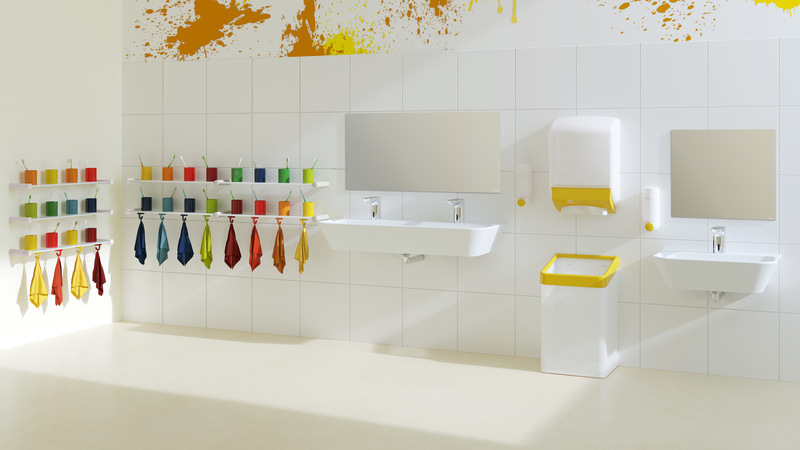 Washbasins made of mineral composite, mirrors made of ESG safety glass and tumbler racks with colourful tumblers made of polyamide provide scope for coloured design in the children's bathroom. They are made of easy-care, durable materials and offer easy and safe use.